“Unless something completely unanticipated happened,” Dave Dombrowski figures the Red Sox will halt all extension talks by Opening Day, the team president of baseball operations told the media (including Chris Cotillo of MassLive.com). Most players like to have any negotiations wrapped up before the actual games begin, with Dombrowski also citing his preference for a lack of distractions. Xander Bogaerts, Rick Porcello, and potentially J.D. Martinez (if he exercises an opt-out clause) are all scheduled for free agency after the season. Talks with Bogaerts earlier this winter failed to materialize into an extension, while the Sox hadn’t yet discussed a new contract with Porcello as of late February. Of course, the Red Sox already took care of one major 2019-20 free agent by inking Chris Sale to a new deal that will keep the southpaw in Boston through the 2024 season. Rays third baseman Matt Duffy is likely headed to the IL to begin the season, manager Kevin Cash told reporters (including Eduardo A. Encina and Marc Topkin of the Tampa Bay Times). Duffy has been bothered by a hamstring problem for much of the spring, and will have tests done after he was a late scratch from today’s game lineup. The versatile Rays shouldn’t have much of a problem filling in for Duffy in the short term, as Joey Wendle, Yandy Diaz, and Daniel Robertson are all options at third base. Encina and Topkin also think that Duffy’s injury could open the door for Guillermo Heredia to break camp with the team, unless the Rays choose to use the roster spot on an extra pitcher. The Yankees are considering including C.C. Sabathia on their Opening Day roster in order to immediately get the veteran lefty’s five-game suspension out of the way, George A. King III of the New York Post writes. Sabathia is already slated for a stint on the injured list as he recovers from an offseason angioplasty and a knee operation, though he would head to the IL after the first five games are up. The downside for the Yankees is that they would have to play with just 24 active players during the course of Sabathia’s suspension, though there is an off-day within those first five games if any pitchers need some early recovery. Yankees general manager Brian Cashman provided a more concrete timetable for right-hander Luis Severino to return from his current shoulder troubles Friday, revealing that the organization doesn’t expect Severino to pitch in a big league game until sometime in May (Twitter link via Bryan Hoch of MLB.com). Severino is currently in the midst of a two-week shutdown stemming from inflammation in his right shoulder’s rotator cuff. He’s expected to begin playing catch next week. There’s more optimistic news surrounding fellow starter CC Sabathia, as Cashman indicated that the veteran left-hander could pitch in big league games in the month of April (via Hoch). Beyond his recovery from offseason knee surgery and an angioplasty procedure, Sabathia is still facing a five-game suspension for throwing at now-former Rays catcher Jesus Sucre late in the 2018 season. Cashman suggested that the team may carry Sabathia on the Opening Day roster, which would allow the clock on said suspension to begin sooner. Given today’s updates from the general manager, it seems that the Yankees will spend at least a month of the season patching together the rotation behind healthy starters James Paxton, Masahiro Tanaka and J.A. Happ. The Yankees have depth in the form of Domingo German, Jonathan Loaisiga, Chance Adams and the out-of-options Luis Cessa, and the frequent off-days baked into the early-season schedule should aid the team as well. The Yankees (like all clubs) won’t technically need a fifth starter for the first couple of weeks because of those off days, which could at least help them patch the gap until Sabathia is ready to take the hill. Still, the timetable on Severino is an unwelcome one — particularly if there are any setbacks or lingering complications from his current shoulder issue. While the Yankees do have the depth to navigate the early absences of Severino and Sabathia, they’ll also continue to be speculatively linked to remaining free agents such as Gio Gonzalez and Dallas Keuchel until that pair has come off the boar and signed with a new organization. Either hurler would be a boon to the projected Opening Day rotation, but signing either would also give the Yankees six legitimate MLB starters for what figures to be five rotation spots if the entire group were to become healthy at the same time. There are also luxury-tax implications to consider; the Yankees’ current contracts bring their luxury-tax ledger to $226MM, per Roster Resource’s Jason Martinez, meaning they would pay a 32 percent tax on any theoretical free-agent signing. 6:55pm: Manager Aaron Boone also spoke to the media today, revealing what many had already expected: Sabathia isn’t likely to be ready for the start of the season, either (link via Bryan Hoch of MLB.com). Despite those maladies, the Yankees expect to use internal options like German, Loaisiga and others to round out the rotation while Severino and Sabathia mend in late March and early April. 3:05pm: Yankees GM Brian Cashman chatted with the media today, discussing in particular the team’s stance on its rotation depth. As Pete Caldera of the Bergen Record tweets, the veteran exec says he’s generally pleased with the existing slate of options. It seems the Yanks aren’t terribly concerned about the outlook for staff ace Luis Severino, who’s laying low after experiencing some shoulder discomfort. Even if he isn’t expected to miss a lengthy stretch, though, some would argue that depth was a preexisting concern given the past health issues of some key members on the staff. Cashman says he “like[s] the personnel” already on hand, downplaying the likelihood of a new outside acquisition. “Can’t rule anything out but the main focus is what we’ve got,” he explained. The Yanks have already added three starters over the winter, re-signing J.A. Happ and CC Sabathia while acquiring James Paxton. Still, rumors have persisted that the Yanks are still kicking around the possibility of adding another arm. Free agent Gio Gonzalez popped up again in trade rumors last night and remains a hypothetical target. Cashman’s true degree of interest in exploring the market is tough to surmise based upon his comments. There are certainly some plausible options on hand, with Domingo German, Jonathan Loaisiga, Luis Cessa, and Chance Adams seemingly being the likeliest to stake a claim. In other news, Cashman touched upon the status of outfielder Jacoby Ellsbury, who will report to Yankees camp in ten days or so. (Via Brendan Kuty of NJ.com, via Twitter.) At that point, the team will take a closer look at the veteran, who never appeared in competitive action last season. Ellsbury has dealt with a dizzying variety of ailments of late, with plantar fasciitis seemingly to blame for his current absence. In a press conference in front of the Steinbrenners, most of the Yankee roster and his wife and kids, C.C. Sabathia has officially announced his intentions to retire at the conclusion of the 2019 season. Included in a statement released by the team was written statements from a wide-ranging collection of voices, including Derek Jeter, Joe Girardi, LeBron James, Fat Joe, Steve Kerr, the major of Sabathia’s hometown Bob Sampayan, Tiki Barber and more. It’s quite the show of support for Sabathia, whose storied career will come to an end after 2019, his 19th year in the league. In a career that included stops with the Indians, Brewers and Yankees, Sabathia has thus far amassed 246 wins in 3,470 innings across 538 regular season appearances, all starts. Presently, he trails Bartolo Colon by one win for the lead among active players. Sabathia is a 6-time All-Star and American League Cy Young award winner in 2007. He was named MVP of the ALCS in 2009 after going 2-0 with a 1.13 ERA in helping the Yankees down the Los Angeles Angels to win the pennant. The Yanks, of course, won the World Series that season, with Sabathia earning his keep in two World Series starts against the Phillies, though the Yanks split the two games in which Sabathia started. Though Sabathia’s career can largely be viewed as a two-part story – the first part in Cleveland, the second with the Yankees – his most memorable performance might be the work he put in for half a season in Milwaukee in 2008. He famously went 11-2 down the stretch with a 1.65 ERA and an insane 7 complete games and three shutouts in 17 starts. Going on short rest multiple times, Sabathia put on a show of endurance and durability plucked from a different era. In doing so, he also became the only pitcher of the Modern Era (since 1900) to record 120 strikeouts with two teams in a single season. We could spend all day lauding Sabathia’s many accolades, and he’s not done yet. For now, Sabathia is fifth in AL history with 2,858 strikeouts, the most ever by a lefty. He is the active leader in that category, as well as innings pitched and quality starts. He has a good chance of overtaking Colon at some point this season for the active lead in wins. The Yankees are likely to closely monitor Sabathia’s workload this season, though he continues to pitch well deep into his thirties, taking 29 turns last year with a 3.65 ERA in 153 innings. Today’s announcement grants Sabathia, 38, the opportunity of a farewell tour as he makes his final starts in ballparks around the league. Sabathia, 38, re-signed with the Yankees on a one-year, $8MM contract early in the offseason, agreeing to return to the Bronx for what will be the final season of his illustrious career. The prognosis at the time of his procedure was reportedly “excellent,” and the quick clearance for Sabathia to resume working out and performing baseball activities speaks to that. In all likelihood, then, the left-hander should be up to speed for Spring Training and on schedule for the Opening Day roster. Recently, the bit of uncertainty surrounding Sabathia was cited by Yankees general manager Brian Cashman as a consideration as he mulls trade offers for right-hander Sonny Gray. Cashman told reporters over the weekend that Sabathia’s situation “has given us pause,” suggesting that he’s at least considered holding Gray into the season. Of course, the Yankees have plenty of other depth options behind Luis Severino, James Paxton, Masahiro Tanaka and J.A. Happ even if Gray is traded. Domingo German, Jonathan Loaisiga, Chance Adams and Luis Cessa all started games for the Yankees last season, and lefty Jordan Montgomery could return from Tommy John surgery at some point late in the summer. Regardless of its impact on any future Yankees maneuverings, the Sabathia update is a welcome one for the Yankees. While the former AL Cy Young winner clearly isn’t the ace he was at his peak, Sabathia has nonetheless recorded three straight seasons of sub-4.00 ERA ball with the Yankees. From 2016-18, he pitched to a 3.76 ERA with 7.7 K/9 and 3.1 BB/9 in 481 1/3 innings — with last year’s 3.65 ERA, 4.16 FIP, 8.2 K/9 and 3.0 BB/9 all being his best marks in that three-year stretch. 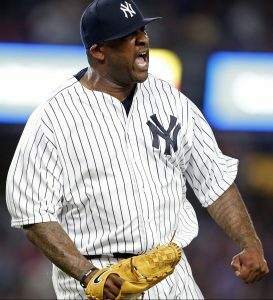 Yankees southpaw CC Sabathia recently underwent an angioplasty and had a stent placed, according to Ken Rosenthal of The Athletic (subscription link). Thankfully, “his prognosis is excellent,” per the report. Angioplasties are utilized to clear blockages in a coronary artery, with the stent functioning to maintain a clear path for blood flow. It’s an oft-performed surgery, but one that’s not commonly performed on professional athletes. Fortunately, Sabathia is not expected to face any particular impediments to his baseball career. He’s slated to pitch for one more season after signing a one-year, $8MM deal to return to the Yankees for the 2019 campaign.